Menudo, an adaptation from the Spanish word meaning “tiny”, refers to a humble, everyday dish of slow-simmered pieces of diced meat mixed with potatoes. 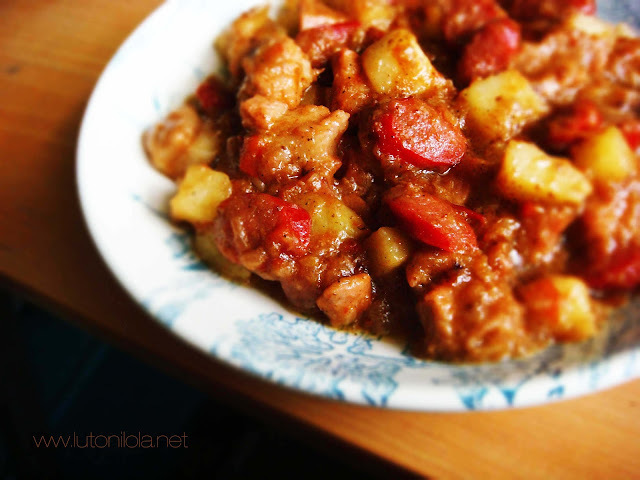 Menudo is a pork stew combined with vegetable and spices. The sweetness and the spice create an explosion of flavor in your mouth. Though, it takes time preparing the ingredients because of all the chopping and slicing, the cooking process is easy since all you have to do is dump everything in. 1. In a small pot, boil the pork in the water for 10 minutes until tender. Skim the foam off the surface, drain the pork and set aside. Then strain and reserve 1/2 cup (125 ml) of the stock. 2. Heat the oil in a skillet and stir-fry the garlic until golden brown, then add the onion and stir-fry until translucent. Add the tomatoes and tomato paste, and cook until soft. Add the pork, liver and bay leaf, and cook for another 5 minutes. 3. Add the reserved pork stock and potato, and simmer for 10 minutes until the potato is soft. Season with the fish sauce and pepper. 4. Add the pimento or bell pepper and chickpeas, and simmer for another 10 minutes. Remove from the heat and serve immediately.